Ocean Galleries welcomes the renowned British Impressionist, Kerry Hallam, to Stone Harbor, New Jersey (9618 Third Avenue/609.368.7777) in August for his first ever exhibition in the seashore community. The new exhibit, “Along the Coast,” will feature many coastal themed paintings as well as his signature nautical chart paintings. “Kerry Hallam – Along the Coast” opens on Friday, August 3, 2018 and runs through Monday, August 6, 2018. Hallam will be in the gallery for receptions from 7:00 PM until 10:00 PM on Friday, August 3 and Saturday, August 4, and from 1:00 PM until 4:00 PM on Sunday, August 5. The exhibition, which is open daily from 10:00 AM until 10:00 PM, is free, with all artwork on display available for acquisition. The prolific and revered artist, who is as refreshing and spirited as his paintings, creates enticing images through bold palettes and captivating compositions. Dedicated to painting for more than 50 years, Hallam’s works spirit us away to experience an alluring atmosphere and the simple pleasures of life. His lifetime of travels has continually called him to the sea and his paintings are like a stage-setting ready to be explored. Enthusiasm for his art is fully evident in Kerry Hallam’s vivid windswept seascapes and timeless, sun-dappled village scenes. Noted for his power to evoke emotion, opulence of light and distinctive color harmonies, Hallam translates the ordinary moment into the magical. “I try to arrive at a definitive statement, a kernel of a landscape or an experience which is universal in appeal,” explains Kerry Hallam. Born in Northern England, Hallam showed early artistic talent when he won a six-year scholarship to London University’s Central College of Art and was formally trained under British Master painters. Britain’s Royal Society of Artists in Watercolor included him for his talent. Highly influenced by Fauvism, Hallam has a strong affinity for the nineteenth century French Post-Impressionists, Cezanne and Van Gogh. In 1981, Hallam opened a studio and gallery on Nantucket Island in Massachusetts. 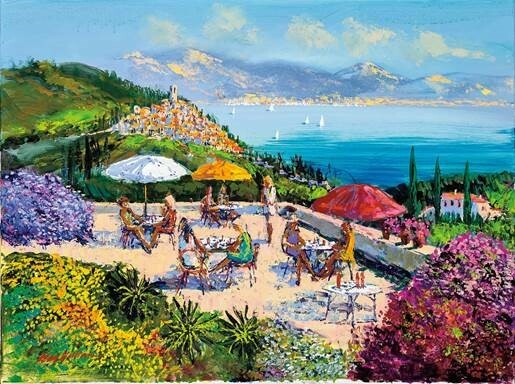 Inspired by St. Tropez and the French Riviera, Hallam returns frequently to renew his spirit and find inspiration for his art. His panoramas continue to draw accolades, including a first-place award by the prestigious L’Association Pour le Promotion Artistique Francais. Through innumerable one-man exhibitions, Kerry Hallam has been honored by galleries around the world. His work has been featured in countless newspaper and magazine articles as well as in PBS television specials. 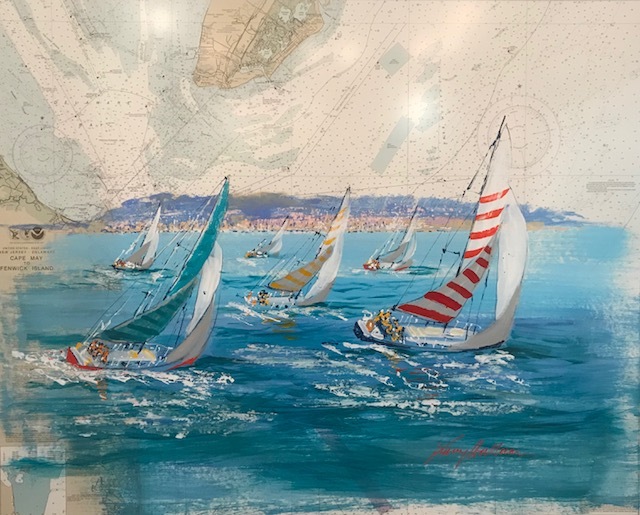 For the Stone Harbor exhibition, Hallam has created an all new collection of artwork which will include acrylic paintings, acrylics on nautical charts, and sketches. There are over 60 pieces in the collection, which will be on display throughout the first weekend of August. 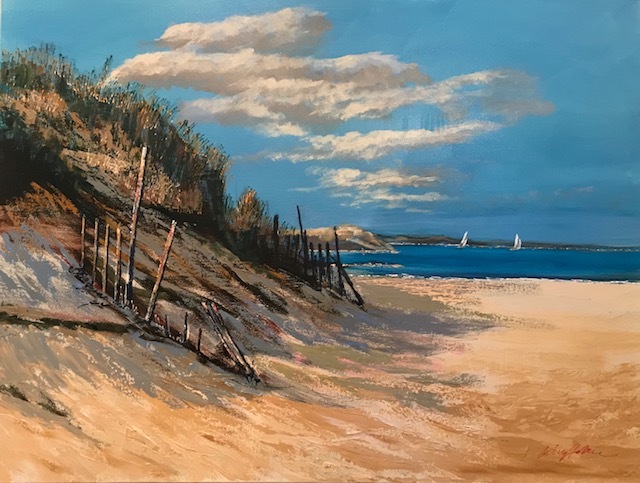 The “Along the Coast” exhibit with Kerry Hallam runs from 10:00 AM until 10:00 PM on Friday, August 3 through Monday, August 6 in the Stone Harbor, NJ location of Ocean Galleries (9618 Third Avenue/609.368.7777). Hallam will be on hand to sign purchased artwork at gallery receptions taking place from 7:00 PM until 10:00 PM on Friday, August 3 and Saturday, August 4, and from 1:00 PM until 4:00 PM on Sunday, August 5. All artwork in the collection is available for acquisition.